Another year of great entries from talented women who all are deserving of recognition. About 300 poems vied for the 7 top spots. The only disappointing part is that most came from Seattle or the Pacific Northwest (hope more of you across the nation participate next time). The judging was very difficult and in addition to the 7 winners I want to acknowledge close runners-up and honorable mentions. 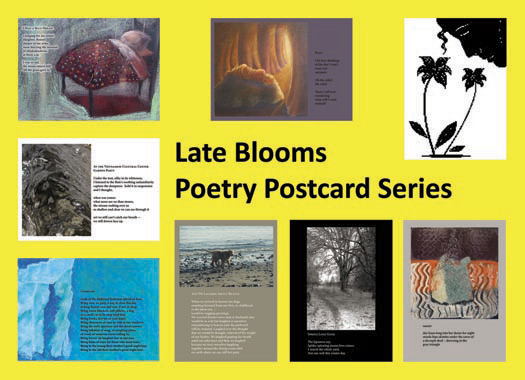 Women artists over 40 provided custom art pieces to go with the 7 winning poems: Nancy Canyon, Lorraine Healy, Jessie Lyle, Kate Lynch, Holly Thomas, Michel Tsouris. "And We Laughed About Heaven"
"I Had a Blue Dream"
"At the Vietnamese Cultural Center Garden Party"
"On a Walk, Thinking of Tania"
"Photo of the School at San Gabriel Dam, 1920"